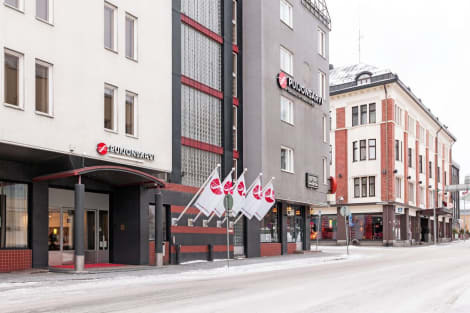 Located in the heart of Kuopio, this hotel offers rooms with a TV and free 1 GB internet access. At Cumulus Kuopio Hotel, separate male and female saunas are available. Kuopio Art Museum is 400 metres away. The in-house Huviretki restaurant offers international dishes for every taste, combined with a good selection of refreshing drinks and beverages. A rich buffet breakfast is served every morning. Guests can also request a takeaway breakfast bag from the reception at any time to enjoy at their own pace. Kuopio Station is within a minutes' walk. The Kallavesi Lake cruises depart 1 km from Cumulus Kuopio. This is a cosy small hotel with good quality rooms and services. When you stay at Spa Rauhalahti Apartments in Kuopio, you'll be near the beach and 3 minutes by foot from Rauhalahti Smoke Sauna. This family-friendly aparthotel is 3.2 mi (5.2 km) from Savonia-ammattikorkeakoulu and 3.5 mi (5.6 km) from University of Kuopio. A stay at Original Sokos Hotel Puijonsarvi places you in the heart of Kuopio, steps from Kuopio Museum and 4 minutes by foot from St. Nikolaos Cathedral. This 4-star hotel is 0.2 mi (0.3 km) from Kuopio Cathedral and 0.3 mi (0.4 km) from Kuopio Art Museum. lastminute.com has a fantastic range of hotels in Kuopio, with everything from cheap hotels to luxurious five star accommodation available. We like to live up to our last minute name so remember you can book any one of our excellent Kuopio hotels up until midnight and stay the same night.